Let's carry on with "My Favorite Things"! No rain drops on roses or whiskers on kittens here, but I wanted to share with you the advent calendar that I made for Lael this year. Obviously it's probably a little late for you to get started on something like this, but keep it in the back of your mind for next year! I bought these little tins at A.C. Moore. They were in a box of exactly 25- how convenient!! I also bought a pack of Christmas card stock papers, a numbers stencil and sticky tac. 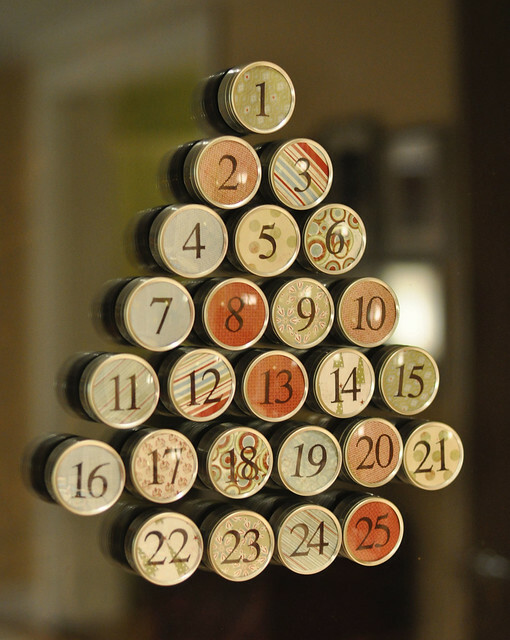 Simply cut out circles, use your stencil to write your numbers and place your circles in the windows of the boxes. You can either choose to use sticky tac to stick them to a window or you can put magnets on the back to put them on your refrigerator. AND, don't forget to keep them out of reach of little fingers! She loves to get her prize every morning after she eats her breakfast! This is something that I can bring out every year and as she begins to understand Christmas more and what it's all about, I can then each day integrate scripture pertaining to Jesus' birth.